Recently, we learned that hotel big data start-up, StayAngel had closed its doors. This is a piece written by the Founder, Mark Ross-Smith, on why they shut up shop. While ultimately it’s a series of events which lead to the downfall of any business, and I am under no illusions on other contributing factors which played a part towards the business failure, there is one major standout dealbreaker which sealed the fate for the business. StayAngel was a big data and predictive behavioural company for the hotel industry. We were exceptional at analysing and predicting spending habits of our members, and the idea is the hotels would recognise the extra revenue StayAngel created for them and give us a piece of the pie. So what happened? Let’s break it down play by play. One of the most frustrating challenges faced by start-ups is landing the first major deal, and StayAngel was no exception. While we were fortunate to have cash flow from premium memberships, it was never a long-term business strategy since this would require huge member volumes to remain sustainable due to the high cost of maintaining our technical infrastructure. We were aggregating and scraping data from a multitude of websites and data provider. As with public data sources, if the data feed changes, becomes restricted, changes formatting or path then it messes with how we can clean, normalise and action this information. One of our most important collection methods was emails which our members would send into StayAngel. Extracting data from these emails was key to understanding where our users were staying, when, room types and so on. Hotels and OTAs seemed to enjoy split testing with hundreds of different versions of the same email, and this caused real problems as we were often unable to read and parse email data. Multiplied by hundreds of data collection scripts and it is easy to begin to appreciate the degree of insanity this would bring a small start-up that had no external funding. As our data sources began to break down, the member base continued to rise and soon we were receiving data at a rapid rate. It was coming at us too fast! On the front-end, for consumers, StayAngel was a price monitoring site. Book a room, and send the confirmation email to us. If your room drops in price between when you made the reservation and check-in, StayAngel will alert you of the price changes so you can rebook it. Over the lifespan of the business, StayAngel sent out 10,000’s of price alerts to members regarding price drops. We were collecting gigabytes of hotel data pricing, consistently analyzing pricing, locations, events, booking types in the background to find relationships and connections between variables in the data we were collecting. The overall goal was to understand exactly how much you would be willing to pay for a room at any given moment in time. While we were alerting users if their room dropped in price, we also informed users when an executive room or suite at the same hotel dropped in price within a range which we thought the member would find attractive enough to upgrade. Of the 1000’s of ‘suite alert’ emails we sent to members, there was an 82.6% email open rate, compared to 21.4% email open rate for price drop alerts. 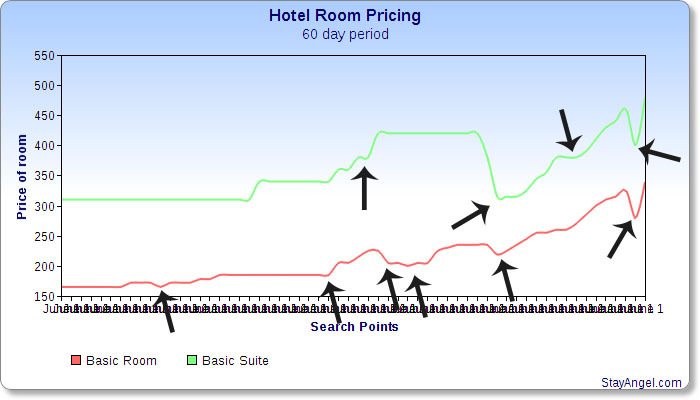 Below is an example of a hotel pricing over a 90 day period and the changes in rates over that time. StayAngel was monitoring prices every step of the way and we highlighted when alerts were triggered to our member on this occasion. What is more interesting comes from users who rebooked rooms when the price dropped. Our data showed less than 100 reservations were ever rebooked at a lower price point. Compare this to the 1000’s which were rebooked into premium rooms & suites, and we could fast see the opportunity for both StayAngel and the hotel. Fundamentally, we had created a better algorithm, better user product experience and had deeper member guest insight than hotels had on their guests and loyalty members. StayAngel had full 360-degree visibility into every hotel booking the member had in the past, and coming in the future. We knew how much some segments of members would pay at select hotels, in locations depending on other factors. StayAngel also had one of the most valuable pieces of data insights possible – we knew how much a guest would be willing to pay for a room, not just what the hotel wants to sell the room for. Most reservation data we had was at Hilton hotels (including sub-brands such as Conrad, Doubletree, etc. 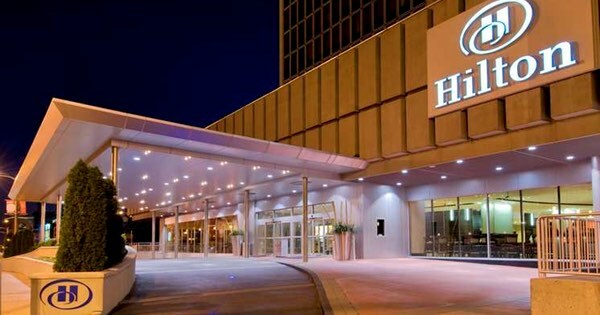 ), and despite already generating new revenues for Hilton, Hyatt and Starwood properties (we had contributed to more than 30,000 room nights on the books and more than US$4 million in booking value) without any formal relationship, StayAngel was primarily giving free money to Hilton. He was speaking about a trial for Hilton to introduce a US$50 cancellation fee on hotel reservations. You can read the full extract here. For consumers, StayAngel was a ‘price drop alert site’. For Hilton, StayAngel was a site which cost them $24,000 in rebooked rooms (lost revenue), and on the other hand, a powerful data intelligence engine which created more than $1,000,000 in new revenue over 12 months. I don’t know about you, but I’d happily give away $24,000 with the left hand if it meant making $1M with the right hand. With this in mind, let’s look at why analytical projects inside large companies fail. There is a recurring theme in most articles on this topic, and I’ve listed some below. These results come from 1 page of Google results, here, here, here, here and here. StayAngel closed because we ran out of runway and couldn’t land a deal with Hilton. Even today, I doubt anyone in Hilton head office knows we existed and the positive impact this could have had on their business with a deal in place. Earlier this year, I published an article titled, How Hotels Use Big Data to Generate New Revenues, which has since been re-published on many of the world’s most popular big data and analytics websites. Directors of Revenue Management and Directors of Pricing at the world’s top hotel chains have commented, liked or shared this article. In this publication, I practically gave away all the IP at no cost to the greater hotel data analysts and yet, our tiny start-up was able to outperform large global hotel chain at their own game. What does this tell you about the state of high velocity, data-driven decision-making at these top hotel chains? These simple data commercialization products have obvious benefits of providing the hotel with new revenue while also turning the guest post-booking dead zone (the time between booking and arriving at the hotel) into a hugely positive experience. Guests could snap up the room they wanted at a price they are happy to pay and the hotel takes in more revenue for doing next to nothing. The flow on effect of rebooking in a higher room category is it also frees up a basic room inventory to be sold again – thus multiplying the ADR/RevPAR (Revenue Per Available Room) further. One of the biggest lessons and the reason I started this blog is that many other travel companies are missing out on lost revenue opportunities every day, and I’m excellent at identifying them.